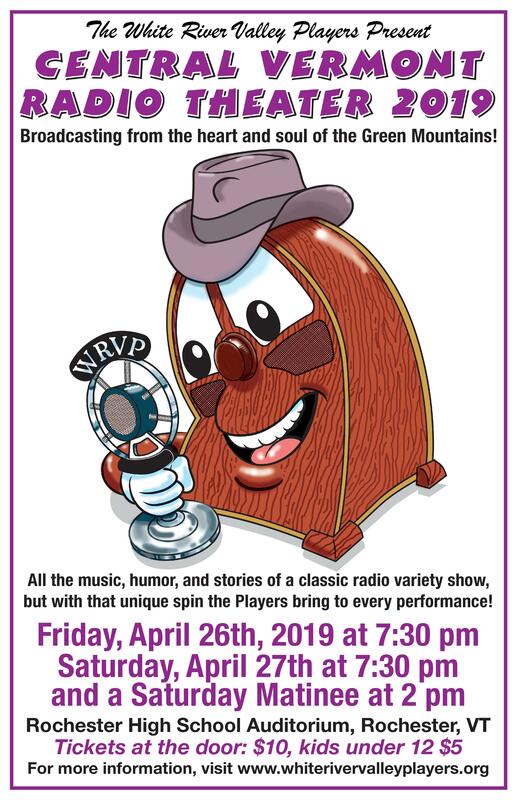 Central Vermont Radio Theater is back! By popular demand the Players are bringing back the show that entertained appreciative audiences in the fall of 2017. The "studio audience" will watch as station WRVP does a live broadcast of all-new stories, music, newscasts, and commercials. Performances April 26 & 27. Details below. We are a community theater group, run by volunteers. Over the years we’ve done a huge range of shows, everything from Broadway musicals to Brecht. We’ve done full-length plays and evenings of original one-acts and produced events that focus on community building and performance such as our annual Harvest Fair (a fall fair on our town green, with a full day of live entertainment, arts and crafts, food, a flower show, children’s activities, and a lot more) which has been a tradition on the first weekend after Labor Day since 1987. We invite you to see one of our shows, attend one of our events, or join us on-stage or off to experience the magic of community theater. There will be other play readings set up on a monthly basis. We'd love to see you!